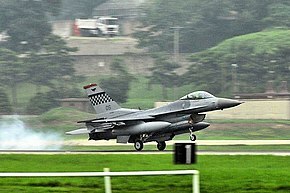 The 36th Fighter Squadron is part of the US Air Force's 51st Operations Group at Osan Air Base, South Korea. It operates the General Dynamics F-16 Fighting Falcon aircraft conducting air superiority missions. The squadron was first activated in 1917 as the 36th Aero Squadron and served in France during World War I, although the war ended before the unit saw combat. It has been continuously active since 1930 as a fighter squadron. The squadron mission is to conduct supression of enemy air defenses (SEAD), air interdiction, close air support, and counter-air missions both day and night. It participates in the defense of South Korea and promotes regional stability. During its 101-year history, the 36th Fighter Squadron has flown 21 different types of aircraft, received 22 unit citations and accumulated 24 service and campaign streamers. The unit came into existence shortly after the United States entered World War I as the 36th Aero Squadron at Kelly Field, Texas in June 1917. Later that year, First Lieutenant Quentin Roosevelt, the son of President Theodore Roosevelt, briefly commanded the squadron. After a brief training period, the squadron moved overseas on the RMS Baltic. Landing in France in September, 1917, the squadron shortly stopped at the Etampes aerodrome before settling at the 3rd Aviation Instruction Center on Issoudun Aerodrome, where it helped building the new center before being declared operational some time at the end of year. On 21 February 1918, the 36th Aero Sqn (Repair) arrived at the Cazaux aerodrome, home of the French Aerial Gunnery School, where it helped maintaining the aircraft of the American detachment. On 5 November, it moved to the newly created American Aerial Gunnery School, in St. Jean de Monts, France. The squadron was reconstituted in 1923 as the 36th Pursuit Squadron. Although inactive, it was originally allotted to the Sixth Corps Area. In 1929 the squadron was designated as a "Regular Army Inactive" unit. Although remaining inactive as a regular unit, officers of the Organized Reserves were assigned to the unit and performed summer training with the squadron at Kelly Field for the next few years. In October 1930 the squadron was once again activated at Selfridge Field, Michigan,[note 1] where it was attached to the 1st Pursuit Group and equipped with various models of the Curtiss Hawk series of single engine biplane pursuit aircraft. By 1932, the squadron's primary aircraft became the Boeing P-12, although the squadron continued to fly the P-6 model of the Hawk. As part of its mission to develop pursuit tactics, the squadron continued to fly a variety of other aircraft, notably including the Berliner-Joyce P-16 and Consolidated P-30 two-seat fighters. Training of fighter pilots and testing of tactics continued after 1932 when the squadron moved to Langley Field, Virginia, where it was assigned to the 8th Pursuit Group. The P-30, along with the arrival of Curtiss YP-37s in 1938 marked a significant change in the squadron's equipment, the transition from fabric-covered biplanes to all metal monoplanes. By 1939, the squadron was flying Curtiss P-36 Hawks, which were quickly replaced by the more powerful Curtiss P-40 Warhawks. As the Air Corps expanded in 1940, the squadron moved to Mitchel Field, New York, and was located there when the attack on Pearl Harbor occurred in December 1941. ^ The squadron's reservists were reassigned to other units. Clay, p. 1401. ^ Robertson Says 4th Air Division. However, in May 1964, the 4th Air Division was a Strategic Air Command bomber division at Barksdale Air Force Base. ^ a b c d e f g h Robertson, Patsy (26 March 2015). "Factsheet 36 Fighter Squadron (PACAF)". Air Force Historical Research Agency. Archived from the original on 6 April 2016. Retrieved 16 February 2018. ^ a b c d e f g h "Factsheet 36th Fighter Squadron". 51st Fighter Wing Public Affairs. 21 January 2013. Archived from the original on 27 September 2015. Retrieved 25 March 2016. Correll, John T. (2008). "The Air Mail Fiasco" (PDF). 91 (3). Air Force Magazine. Retrieved 3 January 2015. Wikimedia Commons has media related to 36th Fighter Squadron (United States Air Force). Jackson, Scott T. "Stoney". "Web site dedicated to all Flying Fiends of the 36th Tactical Fighter Squadron, Osan AB Korea". Scott T. Jackson. Retrieved 25 March 2016.